No matter who your bridesmaids are, here are a few bridesmaid proposal gifts that every one of them will definitely love. Asking your besties to be your bridesmaids is a truly amazing moment during the wedding process. Your best girlfriends have been through makeups and breakups with you. They’ve probably helped you find your prince charming and celebrated with you when you got engaged! So why shouldn’t they be by your side as your bridesmaids on your wedding day? Before you ask them to start choosing dresses and planning your bridal shower, ask them to be part of your bride tribe with a sweet bridesmaid proposal gift. Whether you ask with a beautiful card or at a dinner party, add a gift to make the moment extra exciting. No matter who your bridesmaids are, here are a few gifts that every one of them will definitely love. Asking your besties to help you be the most beautiful bride is made super easy with these bridesmaid bracelets. 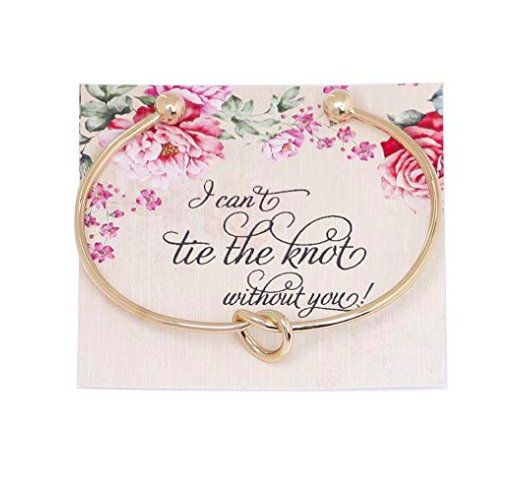 These bracelets come with a floral print “I can’t tie the knot without you” card which is the perfect way to ask your friends to be your bridesmaids. It is something they can wear throughout the planning process and on the big day. Depending on the number of bridesmaids you choose to have, these bracelets come in sets of one, four, or six and come in gold, silver and rose gold. There will undoubtedly be a lot of champagne being drunk during the wedding process. You’ll be having a glass when you find your wedding dress, during your bridal shower and plenty more at your bachelorette party. 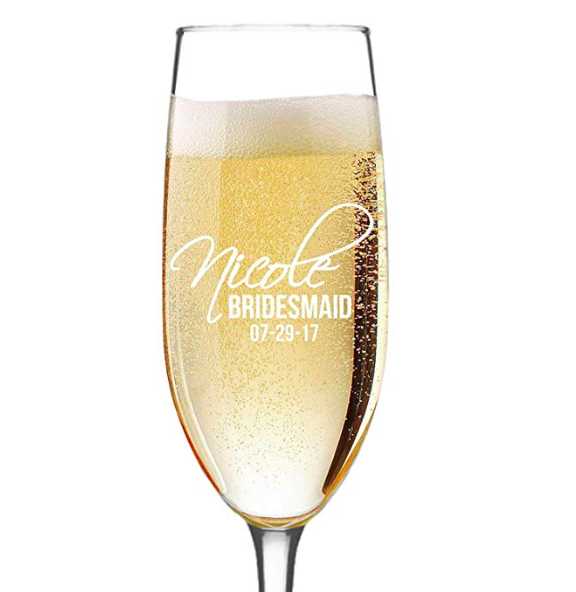 So why not ask your besties to be your bridesmaids with personalized champagne glasses. Engrave your bridesmaid’s name, the date of your wedding or the word ‘bridesmaid’ (or all of the above) on each glass to add a personal touch. Tote bags are such a versatile gift, especially for your bridesmaids. From their planners to a bottle of champagne, fill it with a few things your bridesmaids may need along this journey with you. If you are having a destination wedding, you can add a pair of flip-flops and some sunblock. These tote bags come in a floral design, has an inside pocket, and comes with a favor bag. A chic and comfy kimono robes is a perfect bridesmaid asking gifts. It’s ideal for girls nights in after a long day of bridesmaids duties. You girls could also wear it to your bachelorette party and when getting their hair and makeup done on your wedding day. 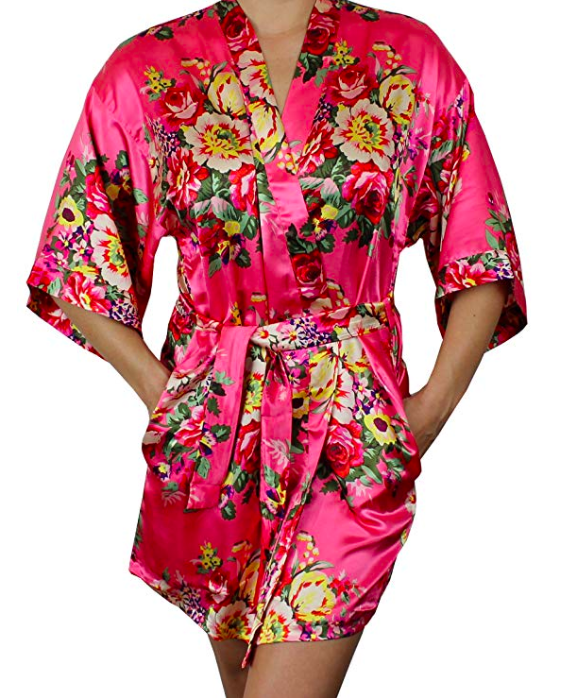 These Ms. Lovely robes come in a variety of colors and have a stunning floral design. Customized each robe with the bridesmaid’s name to add a personal touch. 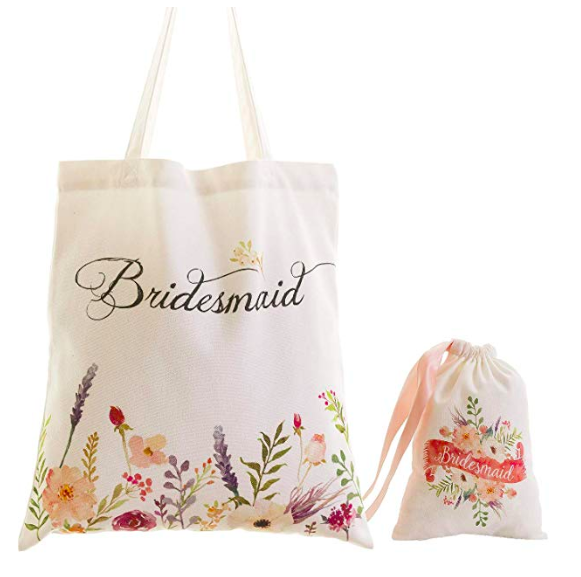 If you’re looking for more bridesmaid proposal gift ideas, head to our online store where you’ll find everything you need to make your wedding day perfect.